Mats Hummels was out injured, so Jogi Low moved Jerome Boateng into the middle and brought Shkodran Mustafi into the side at right-back. Vahid Halilhodzic again made huge changes to his side – he switched five players from the XI which drew against Russia, including four of his front six. Interestingly, he didn’t select anyone who was a booking away from suspension. Algeria have switched between a deep defensive block and a more aggressive midfield pressing system in this tournament, and here they opted for the latter. 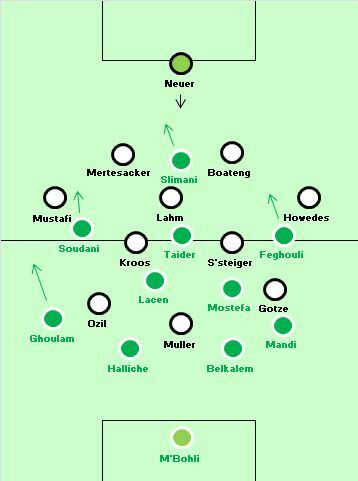 Halilhodzic formatted his midfield so the Algerian trio were in obvious positions to press the three German players in that zone, and forced Germany into some surprisingly sloppy passes throughout the first half, conceding possession cheaply and allowing Algeria to break. Algeria were happy to keep a high defensive line, and in this period Germany lacked someone to run in behind the defence – Mesut Ozil and Mario Gotze tucked inside and came towards the ball, while Thomas Muller usually made lateral runs. It felt like Germany simply needed to turn Algeria, and knock some balls in behind their defence to make up some ground. Algeria were determined to hit the German backline quickly, and the majority of their attacks came from their left, where they’d successfully counter-attacked against Belgium in the first half of that 2-1 defeat. Faouzi Ghoulam repeatedly got forward with Ozil showing little interest in tracking, and he played some dangerous balls in behind the defence, and combined well with El Arabi Soudani. In Algeria’s 4-2 win over South Korea, lone striker Islam Slimani played an all-round game, capable of meeting crosses because of his height, or running in behind the defence because of his pace. 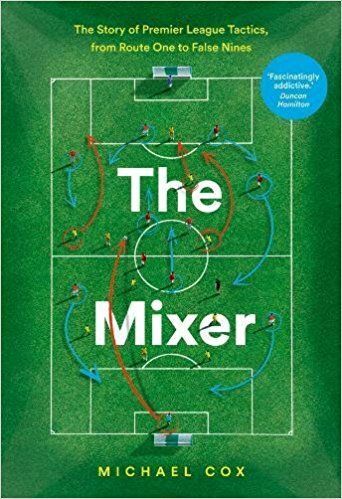 That was noticeable again, and sometimes it was difficult to say whether Algeria’s passes towards him were crosses or through-balls – they were somewhere between, because they were so determined to find Slimani quickly, having broken down the flanks. Algeria were keen to exploit Per Mertesacker’s lack of pace. That’s a long-established weakness of the Arsenal centre-back, but it’s rarely been so obvious, and Algeria constantly attempted to hit long passes just beyond his reach. 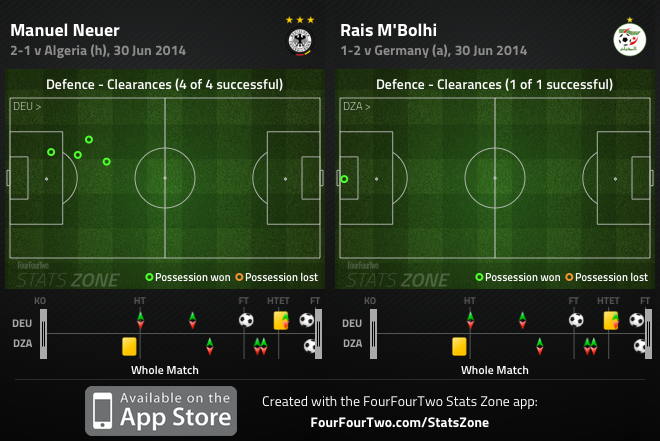 The German centre-backs weren’t helped by the attacking nature of their full-backs. Yet again, they’re both simply centre-backs shoved out wide, and it’s difficult to work out the point of them pushing so high up the pitch – neither contribute much in the final third, and they surely would have been better sitting deep and protecting the centre-backs, who were clearly struggling. The most obvious tactical feature of this game was the extremely aggressive role played by Manuel Neuer, who wasn’t so much a sweeper-keeper, more just a sweeper. He took up extremely high starting positions and repeatedly collected the ball outside his box. There were two obvious examples. In the first five minutes he chased a long Soudani pass towards Slimani and seemed to have misjudged the situation in the right-back zone, but made up enough ground to produce a dramatic slide-tackle. After half an hour, something similar happened – Mertesacker struggled against Slimani’s pace, and Neuer found himself 30 yards off his line, beating Feghouli to a 50:50 ball. Any tiny mistake could have been catastrophic, but Neuer’s decision-making was spot on throughout the game, and had it not been for his proactive goalkeeping, Germany would have struggled against Slimani even more. The repeated nervous clearances helped Algeria pile on the pressure, though, and they also attacked by winning the ball high up the pitch, and through Ghoulam’s dangerous long throws. The frustrating thing, from Algeria’s perspective, was the lack of individual quality at key moments. Sofiane Feghouli, their best player, was capable of a wild shot over the bar when he needed to roll the ball across the six-yard box for a teammate, and then a wasted free-kick from a glorious position. Algeria were tactically perfect, but individually their attackers didn’t have the composure to record an upset. After half-time, the tempo dropped. Algeria didn’t press as intensely in midfield and Germany’s quality became obvious – they retained the ball for longer periods, worked the ball into the feet of the attackers more, and asserted their dominance. The full-backs remained in deeper positions, too, which meant the centre-backs weren’t so prone to Algeria’s counter-attacking. That’s not to say Algeria gave up attacking – but this became more of a classic ‘possession against counter-attack’ contest between a big side and a minnow, whereas in the first half Algeria were playing on the break, but doing so proactively and were genuinely in control of the contest. The more the game went on, the more Germany showed their quality. The introduction of Andre Schurrle, in place of Gotze, was crucial because it provided something different – pace in behind the defence. He stretched the game, forced the Algerian defence into deeper positions, andthis helped put Germany in control of the midfield zone. Algeria’s defenders don’t like playing deep, and gradually they started to invite crosses, particularly from the right flank – something they’d struggled to defend both in qualification, and in the group games. Germany’s threat from the right increased when Mustafi was forced to depart, and Lahm moved to his traditional right-back slot, with Sami Khedira coming into the midfield. Germany’s opener came from a cross – from the left flank, after Aissa Mandi had been caught out of position. Schurrle was the man who grabbed the goal, which was appropriate considering what a difference he had made. The extra-time period was end-to-end, and Algeria simply didn’t quite have enough energy to dominate this period. Halilhodzic might regret replacing injured centre-back Rafik Halliche with another centre-back, Majid Bougherra – he could have dropped a midfielder into the backline, and brought in another energetic midfielder, to help press and win the ball quickly. Yacine Brahimi and Adelmoumene Djabou provided fresh legs, but there were too many knackered Algerians in the final half hour, particularly Slimani. Djabou’s consolation came a minute after Ozil had scored Germany’s second. It was right that Algeria had the final say after this superb performance. Algeria came into this tournament as the most underrated team – 2000/1 shots to win - and they impressed throughout. Halilhodzic deserves enormous credit for getting them to this stage. 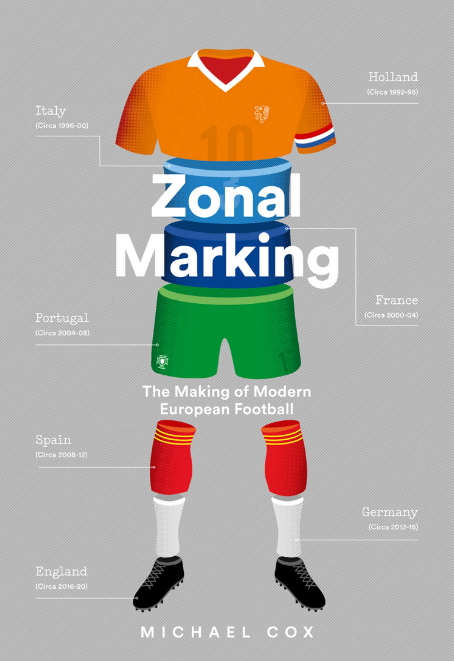 His chopping and changing between matches kept the side fresh and able to press, while the tactical plans were flexible, effective and sometimes fantastic to watch – the thrashing of South Korea was one of the best first half performances of the tournament. He’s improved his reputation more than almost any other coach. What a performance by Neuer. Not really surprising. Not so long ago, at Bayern, he played in the opponents half. And when he lost the ball, he didn’t run back but faced the opponent for a few seconds to avoid the opponent to start a fast break. Maybe not surprising, but it was still one of the best goalkeeper performances in World Cup history. Certainly the most unconventional one and absolutely brilliant. Outstanding goal keeping (or sweeping) indeed. Or should I say: outstanding of course. I don’t expect less from Neuer. For me it is astonishing why some goalkeepers have such a good reputation when they are not more than shot stoppers. It is not only the sweeping, but the so called easy passes as well. He is always available to reveive the ball and often able to pass it to a team mate. The way Neuer played won’t rank him high in any goal keeping statistics. So far we have seen a couple of teams troubling the opponent with a physical and intense game for 60 or 70 minutes. And then they ran out of steam and lost the game in the end. Of course we congratulate this teams for their performance. But, is it a good strategy when you can only play this game for one hour? If a team in England, Spain or Germany would play like this, we would criticise their stupidity and not praise their courage. You could argue that that’s what Liverpool did this season: furious energy early in the game to get a big enough lead so that they could still win when carrying their feeble defence. But you gotta score. The germans made a lot of rookie mistakes, like being sloppy when stopping the ball. they were caught offguard by the Algerian pressing. which is strange, as most people knew this would happen. everyone knew they would be totally motivated, its always hard to play against a team thats weaker than you, but which is way more motivated. personally i was angry when germany tried their slapstick free kick. i wondered if they take the game serious at all. at that point it was 0:0, but they could have easily been 0:2 behind. so why waste such a good opportunity? Löw must rethink. He said in the beginning that he will play with four central defenders beacuse natural full backs wont be able to cover the distance in the brasil climate. but then why does he position them so high and let them move so deep in the opponents half? as the ZM posts say, they dont provide much in the offense, only give the opponents offense an big advantage. Durm has only played one professional season, but same goes for example for Müller in 2010. you could say its easier to fit into the offense, but i doubt Durm would be worse than Höwedes. i doubt löw will change it now, he is stubborn like that and it has cost german teams a lot. problem is still Khedira/Schweinsteinger not being at 100%. with both of them in shape, he could start with them and put Lahm on the right and Boateng on the left and i think they would win the Cup as i dont see a team that could beat them in that setup. Really great analysis Michael on one of the most enjoyable world cup games I’ve ever witnessed! The German line was suicidal. Per lacks pace and Boateng lacks positional awareness. Why not have Höwedes and Boateng switch positions? Lack of chemistry? Can’t be worse than Boateng and Mertesacker. Do they really need to play Gotze and Ozil? Why not bring Schurrle or Draxler in the first 11 to instill more pace? Teams won’t try to dominate possession against the Germans; they’ll sit and wait for the counter. Also, is it me or does France, with their pace and power, seem like the worst match-up for the Germans after their defensive weaknesses were exposed by the Algerians? On the contrary, France are argueably the easiest quarter final opponent Germany could possibly get. They don’t press well, their defense ( without the unfit Sakho ) is a mess and very poor in the air and their attack in the configuration Benzema-Giroud-Valbuena is slow and can’t keep the ball if their life depended on it. The Griezmann-Benzema-Valbuena setup would be better and after the Nigeria match that is how Deschamps should start. Oezil-Mueller-Schuerrle ( for all of you umlaut fans out there ) is simply better though and that applies to the midfield ( if it includes the perennially underrated Khedira ) and defense as well. If you don’t press the German midfield hard you’ll lose,and France can’t do that unless they change pretty much everything about their approach. Deschamps is a locker room manager rather than a master tactician though and while that is exactly what France need, it won’t be enough in this match. Disagree, personally–I think France have the best pressing midfield in the tournament. Their defence also features one of the better man-markers in Koscielny and denying Muller opportunities when Germany only play a single striker could be key. Do think that your suggested German front-line is a good shout though. “a locker room manager”: what has golf got to do with it? I don’t know if you’d agree Michael, but it seems to me Joachim Low might be on the verge of making the same mistake Guardiola did with Bayern – over-egging the pudding. It felt to me like the slow, passing game just wasn’t Germany’s natural game, and it made it so easy for Algeria to press hard and force them into some truly awful mistakes. I’ve never seen a Germany team play so sloppily in possession. I’m used to Germany teams looking up and looking to carve teams open with speed and precision passes, not tika-taka-lite. It seems pressing high up the field is a theme of this WC, and maybe that is seeing the end of tika-taka for now – it’s hard to pass around and keep possession when teams are pressing all over the pitch. Do you also think this puts Low’s decision to only take one striker to the tournament into question? I was screaming for Miroslav Klose to be introduced in the 2nd half – with Lahm going to RB and Schurrle coming on, Klose would’ve been ideal. There were 2-3 moments in the box where I’d imagine Klose would’ve pounced and at least put a shot on target. As you mentioned, there was no directness until Schurrle came on – Gotze, Ozil and Muller are all great players but it feels like a too many cooks scenario. Germany played well in 2010 with Ozil central, Muller out wide, Podolski giving speed down the flank and Klose finishing the chances. The other way around. Pressing is vital to the success tiki-taka earned during the last few years. Shambolic article. Khedira barely mentioned, though he was the man that found all the space for Germany to gain the upper hand. As a reader I can appreciate your complaint regarding Khedira but I would have a look at the definition of “shambolic” if I were you…in any case, I believe Mr. Cox again did a great job. If we assume that one team scored, why not assume that both teams scored their chances. In some ways, I must have been watching another match. Germany’s weaknesses are well known and we saw them in this game. Nevertheless they generated several clear scoring chance and Algeria were lucky to get to extra time. I do think Algeria could have won – if only, as Michael hinted at, they had more quality in attack, and this quality was available in the form of Brahimi. Again I find it incredible that their second best player – one who could have increased their possession and given the rest of the team a respite, was left out of the starting lineup. By the time he got in, their legs were gone and as was mentioned Algeria were sitting back. There was no way for them to hold out. I think Halilodzic did not give his team a chance to win. He only gave them a chance to keep it close. A real shame because the German team was there for the taking. Gündogan and Reus are really missing for Germany. Lahm could play on the right the middle would be full of world class and the wingers all were cutting in and out. The bench would be insanely deep the Benders not even counted in. Suprising fact is that the 1st defense setup for Germany with Höwedes-Merte-Hummels-Boateng has not yet conceded a goal. All goals and chaos came when that line was broken. Algeria was great and played to the limit. First half they forced Germany into the worst tournament performance in the last decade and yet they could have been heavily beaten in second half. Nice game from the africans. I q­­­­­­­u­­­­­­­­it ­working at ­shoprite ­and ­now ­I ­make ­$30h ­- ­$­72h­…­how­? ­I’m working ­online­! ­My ­work didn’t ­exactly ­make ­me ­happy ­so I ­decided ­to ­take ­a ­chance﻿ ­on ­something ­new­… ­after ­4 years ­it ­was ­so ­hard ­to ­quit ­my ­day ­job ­but ­now ­I ­couldn’t ­be ­happier­. ­Heres ­what ­I do…..
Low’s decision is dubious throughout the whole tournament. Playing centrebacks in the fullbacks position? I am aware of his rationale where full backs wont cover much grounds in the Brazil’s horrendous weather conditions. But why would he push them high up? They neither offer any offensive contribution, nor protect more grounds on the back. Using unproven player in the unfamiliar position? Mustafi is just not up to the national team standard. Yet it aggravated the situation when poor Mustafi has to be played out of position. The blame goes to Low. I am surprised the last player selected in the team got the most playing time from all substitutes. Playing high defensive line? We all know that despite the quality elsewhere in this German team. Their lack of speed in the backline will be their major weakness. I wont blame Mertesacker. He is fantastic in positioning and battling in the air. If we retreat him deeper he will be solid. But playing such high defensive line with Merte in the lineup? Benzema and co will be licking his lips into the next game. Despite I am a huge German fan I am pessimistic into the next game versus France if Low is stubborn on his belief. The way this armchair coach sees it, there are exactly two changes that need to be made, and they’re not the ones you can usually read in the press. 1) Schürrle has to play for Götze. Despite winning a MotM award, Götze played a sub-par tournament, so far. This, however, is not the reason why I want this change. One of the most glaring weaknesses in the german game is the AMs inability to press into the box more often. Müller is too often isolated up front, and there’s nobody who goes after the “rebounds”. Schürrle’s direct approach would solve a lot of the team’s offensive problems and give the team the edge and sharpness it is sorely lacking. 2) Durm has to play as left-back. I know he`s a converted striker, I know he’s young and only really played the position for a year, but you gotta make due with what you’ve got. If he’s good enough to be selected for the 23-man roster, then he should be good enough to play, especially if the alternative is quite obviously not working the way you’d like. It’s obvious we’re missing an outlet, it’s obvious we’re lacking width from overlapping full-backs (the potential threat alone would help immensely), and it’s obvious that the defense as a whole is too slow. Höwedes cannot possibly help this team as a left-back, which is evident for four games, now. All that said, the players who did play showed an incredibly sloppy performance in the first half, and all the tactics in the world won’t help you if your execution is as weak as it was on Monday. I give Algeria credit for their performance but the shambolic errors of some of the German players often weren’t caused by pressing. Look at these 3 scenes https://www.youtube.com/watch?v=yGrhnHoQNCc there’s no real pressure on the German players and besides Höwedes they are all players with top class technical skills but still they made simple errors like this all the time. I hope it was just a one off performance and I agree Löw should change tactics. Durm for Höwedes and Schürrle for Götze should make a great difference. Boateng is ok as a right-back and Durm played against Real Madrid so he should be up to the challenge. he does not learn from any mistakes nor rethinks his approach. thats why he will never be a good manager. good managers dont force their ideas when they realize it wont work. if germany wants to win something again they must get rid of Löw. the other teams should be grateful for Löw. France will love to play against such a slow defense line. with a decent manager germany would have all it takes to win the cup. What i am wondering about is the fitness state of Götze. He seemed to have gained additional weight compared to his Dortmund time and is way slower on the field. I think Loew is the worst manager Germany could possibly have in this World Cup. He simply does not have the extra intelligence to take the team all the way to the top. What a waste of wonderful players on him ! He should have been sacked after Euro ‘12. Don’t know why he is still around. He does not have a trophy winning mentality. They need someone like Heynckes or Klopp. I got to disagree though. It wasn’t a master stroke to play on the counter vs Germany for almost everyone does that. Algeria wanted an early goal and then park the London bus. That’s why they ran out of steam after 30 mins or so. Neuer didn’t bail out Germany but it’s Leow’s game plan to play the offside and let the keeper be the sweeper. That’s the most effective tactics vs counter attacking teams. So at least Leow got that right. Algeria got their chances but that’s because Germany committed players on the attack and left holes between the MF and defence. It’s incorrect to say that it is due to Algeria’s tactics or their players’ abilities alone. do you actually think that Löws tactical approach was to have the keeper intervene way out of his box? it is like selling all your belongings and putting all the cash on red in the casino: looks great if it works, but you look like a dumb guy when it doesnt. Neuer admitted that it was very dangerous, he called it “harakiri”. germans use that japanese word for “suicide”. you cannot blame Neuer, he took the only chances he had: go for the ball and clear the situtation. the defense made too many mistakes. waiting in his box would have meant a bigger chance for algeria to score. but that neuer had to come out only means there was something going wrong before. If Neuer is a fraction of a second too late he will get sent off or conceed a goal. (or he plays fair, but the ref makes a mistake and he gets sent off) he had to run out a couple of times, he was lucky that day because normally one of those stunts goes wrong and then germany is out. i highly doubt Löw would do that. he is stubborn, but not a big risk taker in those things. Neuer is most likely the only goalkeeper who could do that, but even he was lucky that it worked everytime. having a striker going one on one with your keeper is part of no tactic. This is my theory since it is even more dangerous to retreat to a low-line defence as it would leave gaps between defence and MF. Such gaps would create more problems. Neuer is very good with his feet and fast so it makes sense to use him as a sweeper. Yes it is risky but as long as outside the D and that the attacker doesn’t have the ball at his feet, I don’t think it is as dangerous as many people seemed to think. In my view the defence did OK as it is hard to paly against such fast counter attacking team unless you also want to play a cautious game. I always enjoy all the ZM game analyses. In terms of the actual match, i must say i didn’t expect Algeria to do this well in this WC especially against the Germans. Unless they find another gear the Germans will not make a permanent mark on this comp. It was a good game! What I don’t understand is why Loew played Mustafi as a RB. Boateng did rather well as a RB, so the logic solution would have been to let Mustafi play centre back, no?…Or Hoewedes in the centre and Drum on the left…At least you introduce some attacking threat or at the very least you keep players on their natural positions. I felt that the German game got better when Lahm went back to RB and Kedihra was introduced, I’m not sure who’s “fault” that was – but it’s sad that Loew had to be forced to make the right decision. Additional point: Why are so many people fond of Neuer. Most of what he did were last ditch solutions. If you do them often enough something will go wrong. Indeed How Neuer plays is a risky approach. But one can see that if he did not play like that Germany backline was easily penetrated. Credit still has to go to him making a right timing when rushing out. This Neuer guy is a good playmaker also. Soon to be the new Xavi imo. Because the back line is slow, opponents play the ball long behind them. If Germany fielded faster defenders, Neuer wouldn’t nearly have as much opportunities to shine.